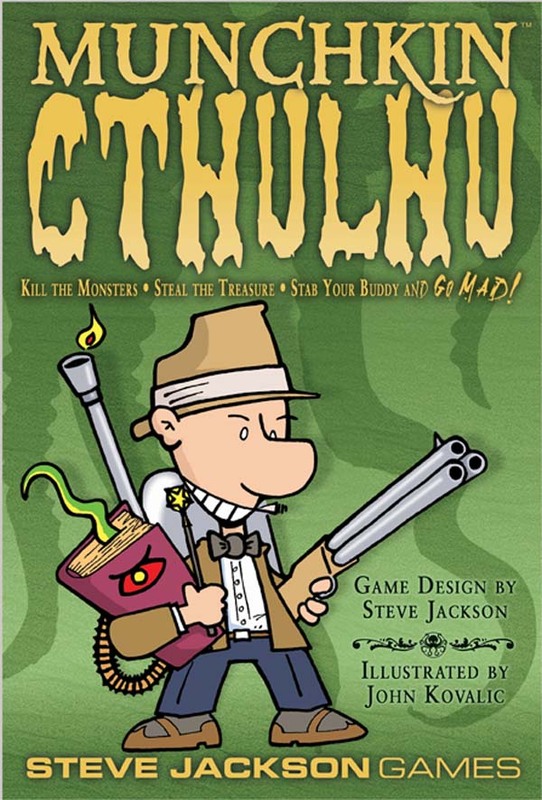 Munchkin Cthulhu is the umpteenth expansion in Steve Jackson Games venerable card game line dedicated to killing monsters, stealing treasure, and stabbing your buddy in the back. This time around though, the game is infused with horrors from beyond time and space drawn from the imagination of H.P. Lovecraft … and a new game-ending mechanic that eliminates one of Munchkin’s biggest flaws. Illustrated by John Kovalic with game design by Steve Jackson, Munchkin Cthulhu is built similar to other Munchkin games. You wander around opening doors (presumably in remote crypts and haunted houses) looking for monsters. If you defeat the monster, you go up a level. If you don’t … Bad Stuff happens (including losing equipment, losing levels, and/or death). The goal is to be the first one to claw your way from level 1 to level 10. There are four classes in Munchkin Cthulhu – Monster Whacker, Investigator, Professor and Cultist. They’re pretty standard (if amusing) fare: the Monster Whacker is an overeager adventure type who gets bonuses for fighting weak monsters and penalties for fighting strong ones. The Investigator can secretly look his/her first Door draw of the turn; if you like it, you can discard three cards to put it in your hand. The Professor’s special ability is “book-learning”; if you’re the lowest level character, and you’re a Professor, you can go up a level for every three cards you discard. It’s the Cultist that transforms the game though. The chief power of the Cultist is that they grow stronger as other Cultists enter the game, gaining a +2 bonus for each one in play. Some card cards have insanity as Bad Stuff, which instantly transforms you into a Cultist. If you don’t want to be one, tough; unlike other classes, Cultist can not be dropped at will. Some cards, like the curse “Dragged off to Snarkham Asylum” cure you of your insanity whether you like it or not. Others like “Gibbering” can be used by other classes to grant a +3 bonus to monsters, but Cultists can use them to give a +3 bonus to themselves. Where Cultists really impact the game is in their unique victory condition. If everyone playing becomes a Cultist, the game ends and the person with the highest level wins. This mechanic nicely shortcuts one of our biggest problems with Munchkin: the never-ending game session. About a third of our Munchkin games achieve this sort of standing wave of conflict where everyone’s high enough level to compete with everyone else, but no one’s got enough power to win (and if they attempt to, everyone immediately gangs up on that person to knock them down). With the cultist victory option, the game suddenly has the potential to end quickly and unexpectedly. Players still strive to gain power by killing monsters, acquiring treasure, and stabbing their buddies in the back, but now they have the added option of corrupting said buddies as well. Winning the game by spreading madness is a nice touch, and it’s put Munchkin back into rotation at our gaming table. Monsters are amusing takes on Lovecraftian staples. There are the Geek Ones (Level 4, -2 against females, Bad stuff: You are geeked out and can’t help anyone until you go up a level), a wide variety of “-goths” (Froggoth, Loggoth and Sluggoth) that you can play from your hand whenever another “-goth” monster in play (identical to the “bats” mechanic in Munchkin Bites, and monstrous versions of horror writers suc as H.P. Munchkincraft (if you meet him, you immediately become a Cultist) and Gram Smoker (+3 against males; bad stuff: Cough your longs out an lose a level). Various Munchkin versions of the Elder Gods make an appearance, including the latest iteration of Great Cthulhu. This level 20 horror’s bad stuff not only kills you, but everyone who escapes goes up a level just to mock you. Also, your new character is automatically a Cultist. This was used to great effect in my gaming group’s most amazing Munchkin victory ever, which is detailed in my Game Day post “Star Spawn Munchkin”. It’s important to note that Munchkin Cthulhu, like all of the Munchkin games, is replete with in-jokes that only fans of the genre are going to get. You might still find some of the jokes funny, but to really get it, you need to be a fan of H.P. Lovecraft’s work, preferably one who’s thrown the dice a few times playing Call of Cthulhu. With that caveat in place, if you fit the bill, and you like Munchkin but wish you could go back to loving it again, then this is the expansion for you.